If the New Year has inspired you to get fighting fit, then you've hit the right page. Technology has the tools to help you get in the shape of your life but it's not easy to know which product is right for your goals. We've enlisted the help of T3.com Editor-in-chief and ultra runner Kieran Alger to put together a four-part guide to help you uncover everything you need to go from couch slouch to marathon finisher. If you're reading this we're going to assume three things. Number one, you've conquered the couch to 5k. Number two: you've successfully trotted out a 10k. Three: there's now a nagging question in your new runner's brain – could I go the distance and do a half or full marathon? The answer you're looking for is YES YOU CAN. You just need a little help. In the final part of our four-step guide to getting marathon fit with your smartphone, follow our essential tips and we'll show you how you can use your phone to go the full 26.2. 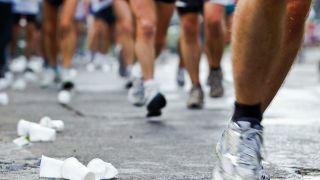 Whether you're looking to walk your first half marathon or run your twentieth full 26.2 miles, WalkJogRun is a fantastic training app created by coach and RunnersWorld.com expert Jenny Hadfield. It'll tell you exactly how far you need to run, walk or jog each to day to train to reach your marathon goal. There are 23 carefully crafted training plans to choose from, covering everything from the absolute beginner to an advanced runner trying to hit a new personal best. We've mentioned the miCoach app before, but the level of detail you get makes it worthy of a second appearance. The app lets you plug in your goal, including distance, date and time, asks for details - like how many times you'd like to train - and your current level of fitness and then fires out your own personalised marathon training plan. You can view it all on your phone and the app uses your GPS tracking to make sure you're doing each session at the right pace and intensity, delivering coaching advice direct to your headphones. Different types of training sessions are essential for improving your running to marathon standard. You'll need a good mix of long slow miles, hills, intervals, tempo runs and speed work. Putting in all those hours on the road, during the cold winter months, is the thing most people find hardest. It can be a lonely place out there at 7pm on a Monday night but it doesn't have to be dull. These apps will help you keep the training fresh and add a healthy dose of fun into the mix. Fartlek is a form of training whose name comes from Sweden - the literal translation is 'speed play'. It involves breaking your run down into segments of varying length and then running them at different speeds. A 100m fast pace followed by 50m recovery, then a 200m medium pace, and 300m recovery. You can do this on your own but Zombies Run recreates this for you by using your smartphone's GPS to create the feeling that you're being chased by hordes of the flesh hungry undead. Your job is to avoid them. We recommended Strava Run as a good running app in part two and one of its strongest features makes it even more effective as a marathon training tool. The app works like any other GPS run-tracking app but lets you choose from a range of runs other people have completed and then go out to beat their time. You can use this new form of competition as motivation for your tempo training, where you'll need to run a selected distance at a specific pace or heart rate.